Truth and MSNBC often times go together much like oil and water. 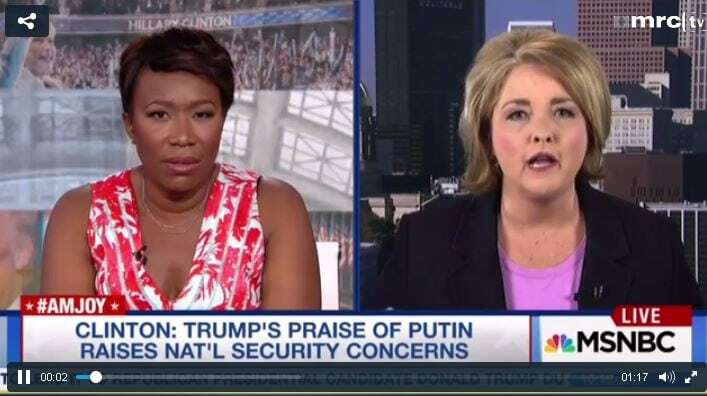 On Sunday, Joy Reid shouted down Amy Kremer, the former chair of Tea Party Express, for saying that some 33,000 of Hillary Clinton’s emails are missing. Reid, Newsbusters said, refused to let Kremer speak after that. The segment started off with a discussion about how Donald Trump asked Russia to find Clinton’s missing e-mails. Reid claimed that Trump wanted them to hack her current e-mail account, but Kremer noted the request was to “find the e-mails.” A reference to the roughly 30,000 e-mails not turned over to the FBI. “That’s how they found them. They found them by hacking,” Reid shot back snarkily. Kremer reminded Reid that it is not known who hacked Hillary’s private server. It is not definitively known if it was hacked at all, but FBI Director James Comey said in his press conference that, “Given that combination of factors, we assess it is possible that hostile actors gained access to Secretary Clinton’s personal e-mail account.” But Comey never indicated who those said “actors” could be. But that didn’t stop Reid from misleading her viewers. “Hold on Amy. The U.S. Intelligence services have said — to a high degree of certainty — that they do believe it is the Russians,” she argued. Giving Reid the benefit of the doubt, she could be get the hacking of Hillary’s server confused with the hacking of the Democratic National Committee, who officials say was hacked by the Russians. Or Reid might be purposely conflating to two. REID: Nope, hold on. You can’t just invent things! You can’t just invent things. KREMER: I’m not inventing anything! REID: You just invented it an entire thing! The FBI has already come out with a report on Hillary Clinton e-mails and what you just said is invented thing! REID: There’s no 33,000 e-mails that are going to harm our national security. You know that there was an entire year and half investigation! So according to MSNBC, there aren’t any missing emails and even if they were missing, they don’t pose a threat to national security. If that’s the case, then why is the media all worked up over them, then? And why are they making a fuss about Donald Trump’s joke that he hopes the Russians find them? Next articleIslam, A Plague, Has No Place In Civilized Society, Despite Western Enablers. The Proofs.